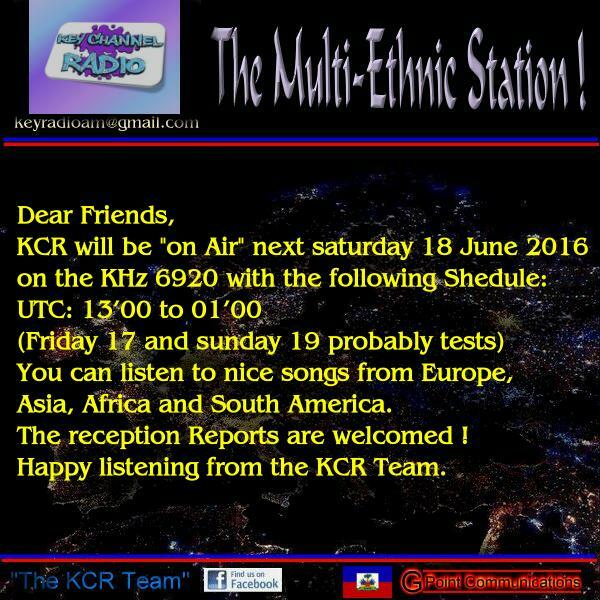 2030-2100UTC and 2330-0000UTC every Saturday evening. We have attached a flyer for our special transmission. sound that tells us who's on air. This is a two part series. Join us on Facebook at: facebook.com/hobartradiointl Over 890 likes! Buzz *and* In The Zone* shows! we can afford more airtime and cover more regions of the world. 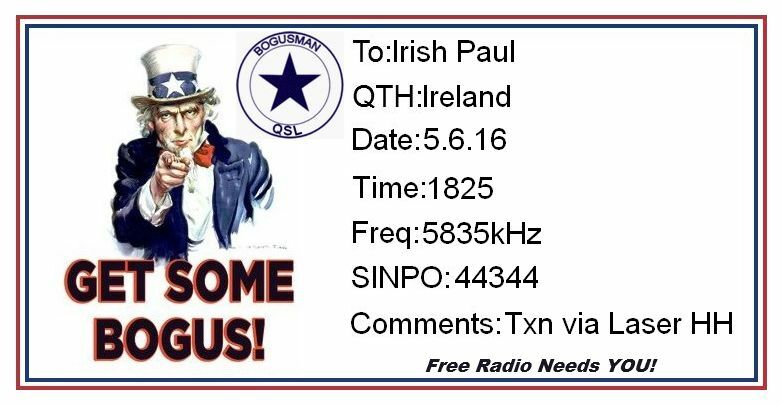 6205-7.28 Coast FM Via Relay In Ireland Pharrell Williams And Heart Sinpo 54444. Later On In The Morning Signal Faded Out Completely. our fourth broadcast on 6920 kHz from 13'00 to 01'00 UTC ( 15'00 - 03'00 CET ) . Such beautiful music of all genres from around the world. 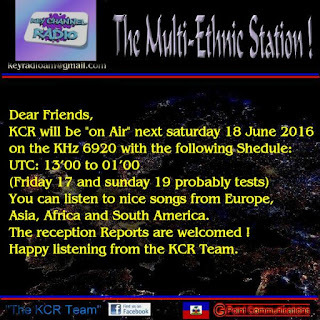 Friday 17 and Sunday 19 we could send test transmissions . Your listening reports are always welcome . If you do not want in the future to receive our E - Mail notify us . Key Channel Radio sarà di nuovo in onda sabato 18 Giugno 2016 con la nostra quarta trasmissione su KHz 6920 dalle 13'00 alle 01'00 UTC ( 15'00 - 03'00 CET). Tanta bella musica di tutti i generi da ogni parte del mondo. Venerdi 17 e domenica 19 potremmo trasmettere trasmissioni test. I vostri rapporti di ascolto sono sempre benvenuti. Se non desiderate in futuro ricevere le nostre E-Mail avvisateci :) . 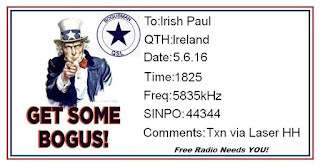 17.00 to 18.00 (Eastern Time) on 7490 KHz - Central & North America via WBCQ.Relays on 19th of June 2016:07.00 to 08.00 UTC on 11650 KHz - Southern Europe - Portugal & Spain via KBC. .08.00 to 09.00 UTC on 9485 KHz - Western Europe & UK via MV Baltic Radio. Radio Northern Ireland Broadcasts On SW Using Relays Services From Europe And The USA. Info On Future Broadcasts Can Found On The Website Along With Recordings Of Past Shows And Much More. Here is the schedule for the next broadcasts of Marconi Radio International (MRI) on 8, 15, 22 and 30 June 2016: 1730-1830 UTC on 13960 kHz (USB mode), 1915-2015 UTC on 15070 kHz (USB mode) and 2045-2145 UTC on 7700 kHz (USB Mode). Our broadcasts include some kind of programmes now sadly missing from most shortwave radio stations: an old style DX show in English “Italian Short Wave Panorama” with lot of recent logs as well as a mailbag programme in Italian. Our station identification announcements are not only in English and Italian but also in French, German, Spanish and Catalan. 6305-21.50 Radio Merlin International Oldies Including ELO" showdown" And Roxy Music" Virgina plane"